South of yesterday's West Approach to the Bay Bridge is the mile long Central Freeway Viaduct. 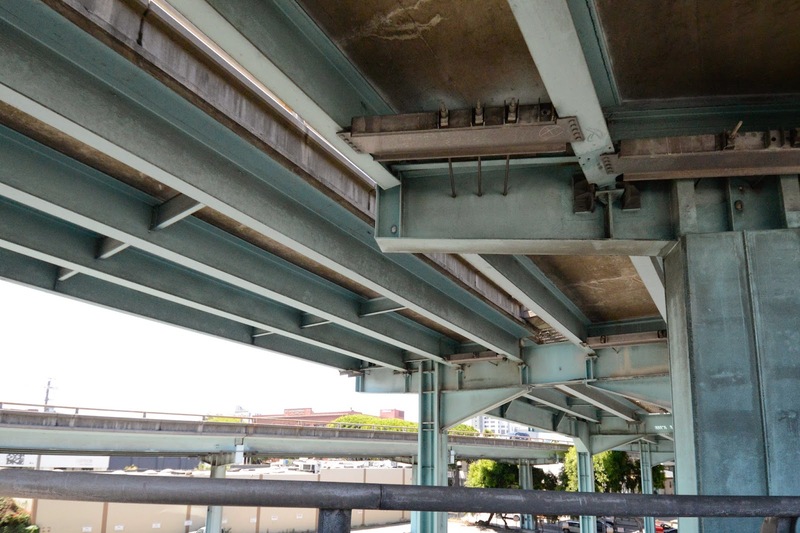 At one time it was planned to make the viaduct part of an elevated loop around the city, but after it was damaged during the Loma Prieta earthquake it was torn down except for the portion that connects Mission Street to the 101/I-80. The Central Viaduct is made of steel columns and steel girders and so it was difficult to increase its seismic resistance. Doubler plates and restrainers were added to improve it's displacement capacity. San Francisco County, California Bridges: Central Freeway Viaduct by Mark Yashinsky is licensed under a Creative Commons Attribution-NonCommercial-NoDerivatives 4.0 International License.